This Week in Science History saw, in 1869, the birth of Hans Spemann, a German embryologist who won a Nobel Prize for his work on embryonic development and discovery of 'organiser' areas in the embryo. Spemann was born in Stuttgart to a publisher and his wife. After attending school and doing a year's military service, at the age of 22 he attended the University of Heidelberg to study medicine. Two years later he moved to the Zoological Institute of Wurtzburg, where he began his career in examining cell lineages, heredity and embryo formation. In the first few years of the 20th century, as a Professor of Zoology at the Zoological Institute in Freiberg, Spemann's work began to focus on the formation of the embryo and the groups of cells in the embryo that would become particular tissues in the adult, and how to extract and study them. In vertebrates, after an egg has been fertilised, the newly formed embryo begins to divide, until it forms a ball of cells. As these cells all migrate around the ball they form what is known as the 'gastrula' stage, with chemicals released at different parts of the embryo telling the cells where to go and what to become - muscles, nerve cells and so on. The part of the embryo that Spemann worked on is known as the dorsal lip. 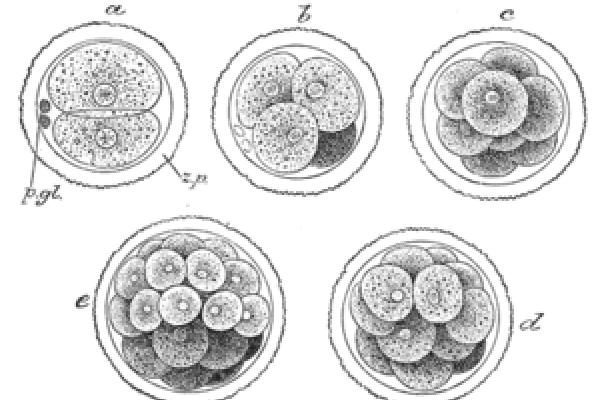 A group of cells on the dorsal lip (now known as Spemann's organiser, after Spemann's discovery) causes the formation of a structure called the notochord. This tells other cells around it to form the nerve cord (i.e. the spinal cord), and groups of cells called somites that will become muscles, parts of the vertebral column and the skin. So essentially this organiser determines which part of the embryo will become the 'back' or the dorsal side of the developed animal, and tells the cells around it what structures and tissues to form, a process known as 'dorsalisation'. In order to prove that it was indeed this area of the embryo that was causing the 'dorsalisation', Spemann and his PhD student Hilde Mangold transplanted a group of cells from the dorsal lip onto the opposite side of a second 'host' embryo. They used different species of salamander as the donor and the host, chosen as their colouration was different and the cells from the donor and the host could be told apart. What they found was extraordinary. Where they had implanted cells from the donor's dorsal lip, a second notochord formed, which told the host's cells to form a second spinal column and set of somites on the opposite side to its original ones - basically forming a Siamese salamander, with two spinal columns, two heads and two tails, but sharing a single 'belly'. This proved that something in that group of cells was responsible for organising the surrounding cells to form dorsal structures like the nerve cord and the somites, hence why Spemann termed the group an 'organiser'. This work took Spemann and Mangold the best part of 10 years to complete and it was published in full in late 1924. Tragically Hilde did not live to see the publication as she was killed in a domestic explosion in September of the same year. The work they had completed together led to Spemann receiving the Nobel Prize for Physiology or Medicine in 1935. Spemann continued to study different organisers, as well as pioneering techniques that were the first steps towards cloning, right up until his death from heart failure in 1941. His discoveries led on to further investigations into 'organisers'. For example, we now know the exact chemicals that are released by Spemann's organiser that cause nerve and somite formation - chemicals with names like noggin, chordin and follistatin. All these chemicals are, evolutionarily speaking, pretty ancient. Similar versions are found in all vertebrates and in arthropods such as fruit flies. The ability of cells in an early embryo to know whether they should form 'back' or 'front' structures & tissues is clearly essential for the development of an animal and so the chemical mechanisms behind it are thought to have evolved in our common ancestor with arthropods over 500 million years ago. Spemann's work throughout his life broke new ground and has been fundamental to our understanding of how dorsal structures of an embryo are formed. The Nobel Prize was a fitting reward for years of hard work into embryonic development, and it is tragic that his student and colleague Hilde Mangold, who helped him complete the work, did not live to see their success.